Grace | What Happened To Her Face? For all those lucky folks out there who encounter my gregarious social butterfly Adelaide and her Port Wine Stain, I tell you: Go ahead, Ask. Seriously, mention it. Ask about it. 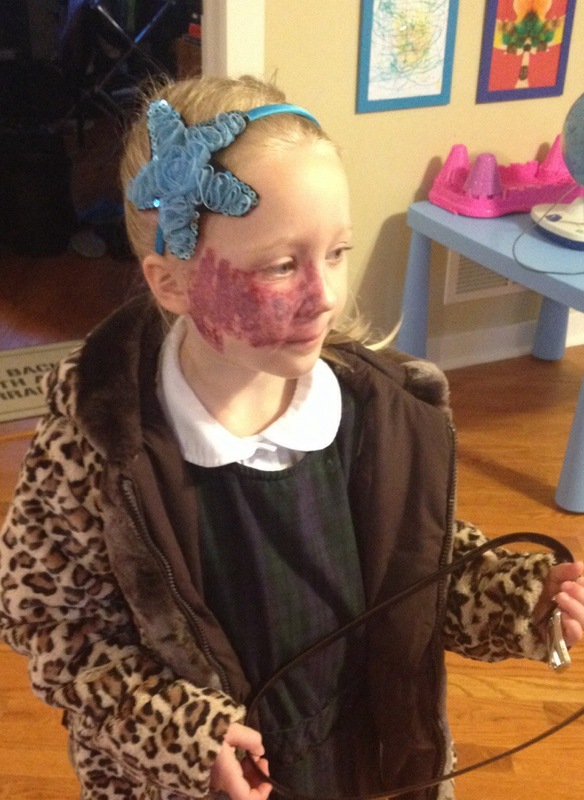 Don’t worry about ‘shush’-ing your kid when they ask Addy what’s on her face. It’s good for her, and, honestly, my favorite topic in the WHOLE ENTIRE WORLD is my offspring, so, naturally, anything to do with them is a fabulous topic for me to talk on. I want to talk about it. I want to tell you about Addy. To tell you what it was like to see her face for the first time. To share all my rookie scientific knowledge of those blood vessels and nerves and treatment options and research. And how awesome Children’s hospital has been to us. And how we’ve navigated her self-esteem so far. And what I’m afraid of in the future. Because in my experience, all my chattering will prompt you to remember some long-forgotten relative or acquaintance with a port wine stain or something like it, and when you tell me all about your uncle, I’ll learn just a little bit more about how to raise a kid whose face carries a mutation, and how to do it better. So please, ask. I want to answer. First, don’t worry; there will always be people who disapprove of your decisions. They can’t do anything about it, so let them stew. So, kindness is key. But how do we make others comfortable when we’re toting a small child who looks like she’s been in a barfight? And in only a quick minute or two of passing conversation? ‘Zapping’ also sounds casual and surprisingly noninvasive, and makes people smile. (What kid hasn’t shuffled their stockingfeet on carpet and zapped a door handle?). Pointing out the relation to cosmetic surgery seems to make people more comfortable that this is a simple, noninvasive procedure. When you speak with easy confidence and a smile, rolling your eyes at how these blood vessels just keep growing (and growing, and growing), waving your hand when you tell them “Oh, she’s fine,” and shrugging when you tell them she’s going in for another zapping soon, they’ll usually relax. You’re cool with it, they can be cool with it, too. When you’re with your close friends and confidants, you can relay your anxieties, fears, and worries – after all, this is your daughter and there’s a lot to worry about. But as long as you’re in casual conversation, just make people comfortable, and you’ll find that most respond with kindness. Today I walked the girls down to our local Dairy Queen – it was hot and humid and a perfect day for ice cream. We arrived sweating and flushed. Another customer pointed out to me that Addy might be getting sunburned. Siblings. They’re as honest as every other kid out there. Last night we went out to eat at Noodles. It was dinnertime, so there were lots of families with kids. We found a table in the back, by a family with a couple of little girls who were somewhere between kindergarten and third grade. (I can’t tell kids’ ages, so that’s a guess; older than Addy, still quite a bit younger than tweens.) While we approached and were getting settled, one of the girls noticed Addy’s face, still quite bruised from laser surgery. The girl caught her friend’s attention and gestured toward Addy. They stared wide-eyed. Then they started whispering furtively together; one kept touching her own cheek while they were discussing the sight. There was something about their manner that brought back every memory of junior-high-female cattiness – that kind of “Ohmygosh, did you SEE her outfit?” posturing, leaning forward to whisper together importantly, stopping to turn and stare, then ducking back into the gossip. And it infuriated me. I could a) ignore them, b) obey my ursine maternal instinct and cross the eight feet between us to give each one a good smack upside the head, c) find a happy medium and just stand there glaring at them until they got uncomfortable, which would have looked weird in public but still been at least mildly satisfying in a passive-aggressive way. Since I’m not writing this from the local jail, you can assume I went (reluctantly) with Option A. 1) The girls’ parents were sitting right there, and would have noticed me. Darn it. 2) Addy was completely oblivious, so… if I’m honest with myself, I’ll admit… no harm done there. 3) There’s a solid possibility that these were actually, truly, good girls. Girls who would never in a million years intend to hurt anyone’s feelings. Girls who are too little to understand that their innocent whispering could be noticed, let alone misconstrued. Girls who have never seen a half-purple face before and are simply trying to figure out what might have happened to it by talking about it together. Girls who are just old enough to start innocently adopting those chattering female mannerisms that carry such baggage for those of us who survived junior high. So, I sat down at our table and ate dinner like an adult. Every once in a while I glanced over to observe the girls, and they seemed to be normal. I’m not sure exactly what that means (like how nasty the normal ones can get), but at least they weren’t running around hitting old ladies or laughing at people in wheelchairs. So, maybe I can give them some room to be curious.